“I’m trying to better understand how emerging technologies and materials will perform in nuclear reactors,” said Field, recipient of UT-Battelle’s 2018 Early-Career Researcher Award. With techniques including advanced electron microscopy and neutron scattering, Field characterizes materials for reactor structural components and fuel cladding. His primary focus is research that advances the light water reactors supplying approximately 20 percent of U.S. energy needs. America’s nuclear power plants were designed to operate for 40 years but may be capable of running for a century. To ensure their safe, efficient and economical performance, researchers need to know how irradiated materials might behave beyond planned operational lifespans. “How can we make a material look 80 years old but do it in only 4 hours?” Field asked. That’s a big challenge, but ORNL facilities can age a material to end-of-life conditions in less than a year. The key is introducing radiation damage into materials by a mechanism familiar to pool players—displacement. During the break, a cue ball smashes into billiard balls, scattering them. Likewise, a neutron produced in a nuclear reactor collides with the atomic lattice of a material in the reactor wall, moving atoms and creating defects. The High Flux Isotope Reactor, a DOE Office of Science User Facility at ORNL, speeds the process of atomic displacement—akin to more cue balls smashing billiard balls in the same amount of time. Field grew up in a farming town in Illinois. His brother’s chemistry career inspired him to give science a try. He enrolled in a mechanical engineering program at Michigan Technological University only to discover he didn’t like mechanical engineering. He shopped for a new major and picked materials science and engineering. For his senior project, Field used simulation to redesign the casting of a differential bell housing [powertrain part] to optimize molten material flows and eliminate porosity. Continuing on to grad school at the University of Wisconsin, Field explored how radiation-induced defects in iron-based steels move within an atomic lattice. His dissertation work required a tool unavailable in Wisconsin. It was, however, available in Tennessee—at ORNL. Subsequently, Field spent about a week every two months at ORNL. “I literally had a second home here my last three years of grad school,” he said. In 2012, he defended his thesis and accepted a postdoctoral position at ORNL as a Weinberg Fellow on the same day. He studied concrete, which he calls a “living material” that changes with time, water content, chemical composition and irradiation. To unwind, Field likes cooking and fly fishing. At home, he and his wife, Beth, a pharmacist, rehearse their work talks with each other. “She can give just about any technical presentation I've ever delivered because I practice in front of her every time. She has a junior achievement badge in material science and radiation effects,” Field joked. The couple had their first child in November. Field is currently reading a first book to his daughter—Atomic Accidents by James Mahaffey. Defects change how a material behaves. “Trying to understand that process is fairly complicated, and I use a lot of different tools to do that,” Field said. To obtain a “snapshot” of a material’s microstructure after irradiation, Field uses small angle neutron scattering at HFIR. “You’re using neutrons to change your material, and then you’re using neutrons to analyze the material,” he said. HFIR staffers have long used lead-lined, soda-can-size containers called “pigs” to transport radioactive samples. Now they’ve designed “piglets” to move smaller samples. A candy bar–size piglet is transparent to neutrons but blocks gamma rays. “You just take a piglet housing your specimen to HFIR, and HFIR staffers analyze it and you have your data,” Field said. Materials can be examined in mere minutes. 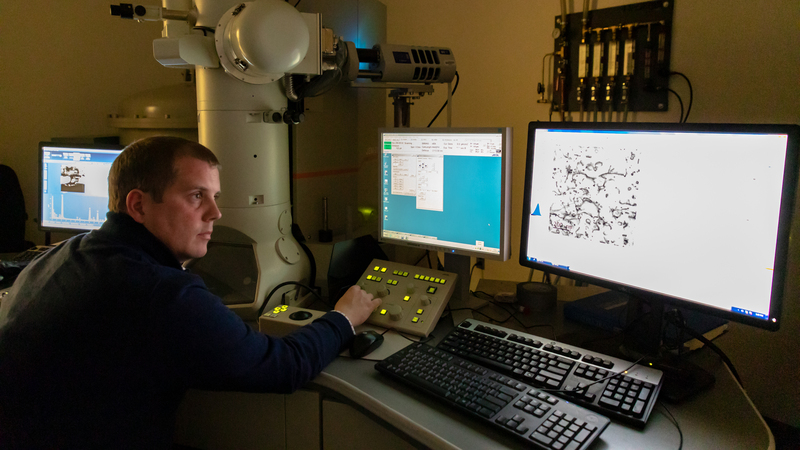 For high-throughput characterization and analysis, Field also has started using machine learning to identify and count unique features in more than 10,000 material images that he has amassed working with ORNL colleagues Yukinori Yamamoto to develop new alloys and Kurt Terrani to tailor those alloys for accident-tolerant fuels. “An image can have from five to a hundred different unique features,” Field said. Having a machine do the counting is easier than doing it yourself. An ORNL program advances accident-tolerant fuel applications, such as fuel cladding that can endure high temperatures longer than can today’s zirconium alloys. For this program, Field works with an alloy system of iron, chromium, and aluminum, FeCrAl. The eventual goal is to produce, on a large scale, pencil-size fuel tubes from the alloy that can be quickly deployed in nuclear power plants. Because FeCrAl is extremely oxidation resistant in high-temperature steam environments, Field and others believe it may be able to avoid accidents in which material overheating plays a role, such as the Fukushima Daiichi disaster. The DOE Office of Nuclear Energy and Office of Fusion Energy Sciences support Field’s research. Additional funders include EPRI, GE and Global Nuclear Fuel.